Given these findings about how students today define “research” and approach the research process, teachers are faced with identifying and teaching middle and high school students the skills they will need to be smart information seekers in the digital age. The data indicate that teachers in this study place tremendous value on research skills, with most reporting assigning a research paper to their students in the 2011-2012 academic year and spending class time teaching various research skills to their students. These lessons are aimed at addressing deficits they see in today’s students. Most notable among these is the inability to judge the quality of information, a skill the vast majority of teachers deem “essential” for their students’ future success. Among the teachers in the study, the majority assigned at least one research paper to their middle and high school students in the 2011-2012 academic year. 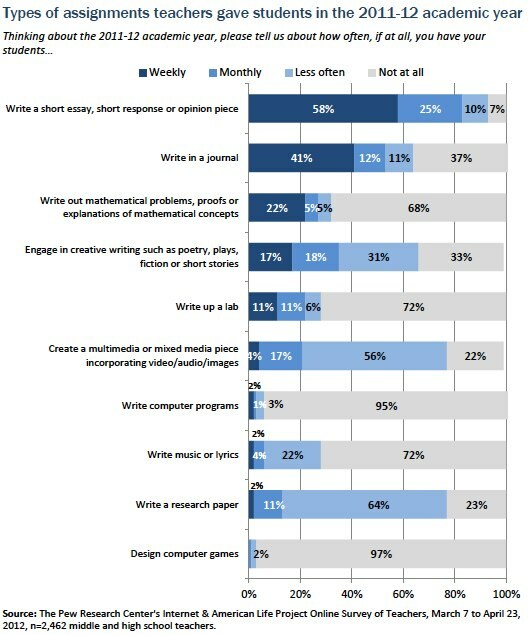 As the graphic below suggests, among this sample of teachers, short essays and journaling are the most commonly assigned writing tasks, with more than half of the sample (58%) having their students write short essays, short responses, or opinion pieces at least once a week and 41% having students journal on a weekly basis. Research papers—along with multimedia assignments and creative writing in the form of plays or short stories—are not assigned by many teachers on a frequent basis, but are assigned at some point during the academic year by most of the teachers in our sample. Just over three-quarters of these teachers report having students complete a research paper (77%) or a multimedia project (77%) at some point during the current academic year. Two-thirds (66%) have students complete a creative writing assignment during the year as well, such as writing poetry, a play, a short story, or piece of fiction. Some teachers are more likely than others to assign a research paper; not surprising given the different skills and subjects being taught. Fully 94% of the English teachers in this sample assigned at least one research paper in the past academic year, compared with 83% of history/social studies teachers, 68% of science teachers, and 36% of math teachers. Almost nine in ten teachers who participated in the NWP Summer Institute (88%) reported assigning a research paper in the 2011-2012 academic year. 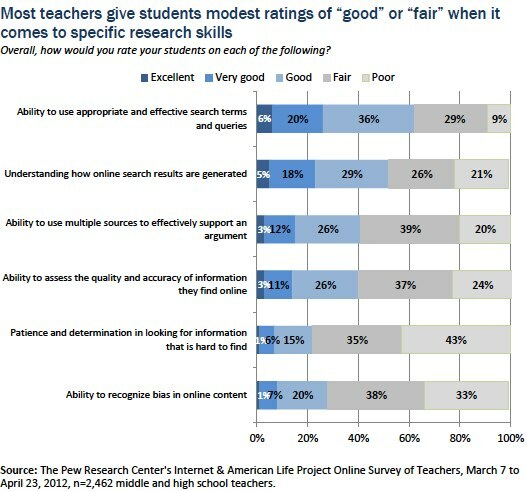 Despite the overall perception that the internet and digital technologies have a “mostly positive” impact on students’ research habits, in most cases the AP and NWP teachers surveyed rate the specific research skills of their students “good” or “fair.” Very few teachers rate their students “excellent” on any of the research skills asked about in the survey. Overall, teachers gave students the highest ratings on their ability to use appropriate and effective search terms and understanding how online search results are generated. Yet even for these top items, only about one-quarter of teachers rated students “excellent” or “very good.” And in focus groups, many teachers suggested that despite the current generation of middle and high school students being raised in the “digital age,” they are often surprised at how poor their students’ search abilities are. Reflecting teachers’ concerns about the impact of the internet on students’ expectations of “instant information,” the skill they rate students lowest on is “patience and determination in looking for information that is hard to find.” Fully 43% of the teachers participating in the survey said that overall they would rate their students “poor” in this regard, and another 35% rate their students “fair” when it comes to patiently pursuing information they need. These relatively low ratings (of what are by and large honors and advanced students) may reflect teachers’ expectations of the skill level they would like to help their students reach, yet survey results indicate that teachers see room for students to improve in most, if not all, of these areas. Two patterns emerge in looking at the ratings teachers give their students on their research skills. In the case of all but one skill asked about, more teachers of the lowest income students rate their students “poor” than do teachers of higher income students. The only exception to this pattern is “Patience and determination in looking for information that is hard to find” on which teachers across different socioeconomic levels rate their students equally. A second consistent pattern that emerges is that teachers with more classroom experience (16 years or more) perceive their students’ skills more positively across the board. Teachers who have been in the classroom for 15 or fewer years, in contrast, seem to have more negative views of their students’ research skills and more of them rate their students “poor” on every skill asked about. What research skills should be taught? Both the survey and focus group asked teachers which research skills, in particular, are critical for the current generation of middle and high school students to learn. In focus groups, the most commonly cited skills were how to evaluate the quality of information, how to recognize what information is and is not relevant to the question at hand, and how to synthesize information from multiple sources into a coherent piece of work. Survey findings echo these sentiments. The vast majority of teachers surveyed feel that “courses or content focusing on digital literacy must be incorporated into every school’s curriculum,” indicating just how critical they feel the ability to locate and assess information in the digital world is. About half of the teachers in the study (47%) say they “strongly agree” and another 44% “somewhat agree” with this proposition, meaning that 93% of teachers support this curriculum change. NWP Summer Institute teachers are particularly likely to take this view, with 59% saying they “strongly agree” that this curriculum change is needed. Also expressing strong views on this question are teachers of students living below the poverty line, 60% of whom “strongly agree” such courses are needed. Moreover, asked to place a value on various skills today’s students may need in the future, “judging the quality of information” tops the list, along with “writing effectively.” These two skills were described as “essential” by 91% of the teachers who participated in the survey. Other skills relevant to the current digital culture also ranked high, with large majorities of teachers saying that “behaving responsibly online” (85%) and “understanding privacy issues surrounding online and digital content” (78%) are “essential” to their students’ later success in life. While evaluating the quality of information tops the list of essential skills, 56% of survey participants also feel that “finding information quickly” is essential to success. Another 40% describe this skill as “important, but not essential,” indicating that while teachers place tremendous value on teaching their students to assess the quality of information, they also appreciate the importance of speed in today’s fast-moving digital world. Those who have been teaching longer (16 years or more) are slightly more likely than those teaching 15 years or fewer to describe this skill as “essential” (60% of more experienced teachers v. 52% of newer teachers) but otherwise no notable differences exist across subgroups of teachers. When should these skills be taught, and by whom? While the AP and NWP teachers in the study generally agreed on what skills are needed and that these skills should be a part of standard curricula, there was less consistency in their opinions of when these skills should be taught and by whom. Asked at what point in their educational careers students should learn these critical research skills, many focus group participants felt they should be taught in elementary school, and that students should already possess these skills prior to entering middle school or high school. Others felt that elementary students may not be ready to learn the nuances of bias, fair use, and salience, and that these more advances skills are better taught later in a student’s career. The question of who should be mainly responsible for this part of the curriculum was also open to debate in focus groups, with some teachers openly acknowledging that they do not currently feel qualified to teach some of these skills. Some reported that their school’s English department takes the lead in developing research skills, and that their own role is mainly reinforcing these skills. Yet others suggested these skills need to be taught by all teachers across the curriculum, and that library staff can be a key part of that process. Asked about different approaches they use to develop effective research skills in their students, two different tracts emerge—first, spending class time teaching and developing these skills, and second, designing assignments that require students to use new or different approaches. 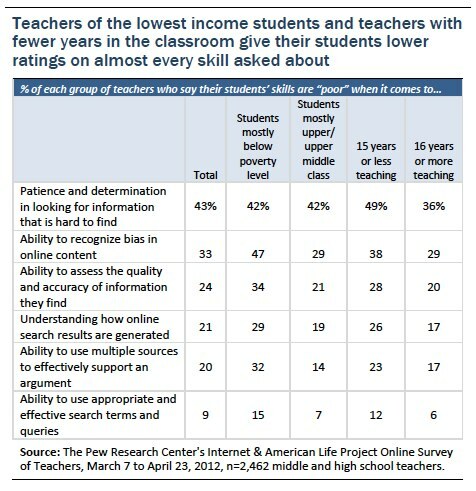 In terms of devoting class time to this area, fully eight in ten of the AP and NWP teachers who participated in the survey report spending class time discussing how to assess the reliability of online information, and seven in ten spend class time generally discussing how to conduct research online. 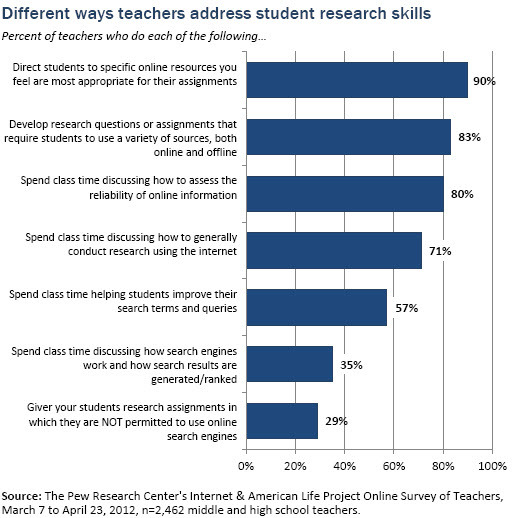 Fewer teachers, but still a majority, say they spend class time helping students improve search terms and queries, yet just one-third devote class time to helping students understand how search engines work and how search results are actually generated and ranked. A second strategy these middle and high school teachers use is intentionally constructing or shaping research assignments in ways that either direct students to the best online resources, or require students to expand the repertoire of sources they use. Nine in ten survey respondents report directing their students to specific online resources they feel are most appropriate for a particular assignment, and 83% develop research questions or assignments that require students to use a variety of sources, both online and offline. Substantially fewer teachers, just 29%, assign work to students in which they forbid the use of online sources. Suggestions in the focus groups that English teachers generally take the lead on teaching these skills were echoed by survey results. English teachers in this sample are the most likely to report implementing each one of these lessons/approaches, followed closely by history/social studies teachers. For example, 93% of English teachers in the sample report developing assignments that require students to use a variety of sources, followed by 91% of history/social studies teachers, 77% of science teachers, and 47% of math teachers. Similarly, when it comes to spending class time discussing how to assess the reliability of information, English teachers take the lead (94%), followed by history/social studies teachers (90%), then science teachers (69%) and math teachers (46%). The merits of these latter strategies—structuring or shaping assignments in ways that required students to use particular sources or more varied sources—was discussed at length in focus groups. Many teachers reported requiring students to utilize offline resources in an effort to familiarize them with materials they might not otherwise use. Others said they stress to their students the importance of paying attention to website domains, and encourage or require them to use .gov, .org or .edu sites. And many teachers reported banning the use of particular online sources, most commonly those with user-generated content such as Wikipedia, or telling students exactly which online resources are most useful or even permissible for particular assignments. At the same time, teachers felt that eliminating the use of all online resources or even particular online resources in assignments is unrealistic and can be counterproductive. Because students are already reliant on these sources when they arrive in middle and high school, and have a comfort level with them, many teachers feel a better approach is to teach students how to use these tools effectively. Indeed, in student focus groups, teens acknowledged that even when they are “not allowed” to use Wikipedia in their research, it is still often their “first stop” in completing an assignment. Students feel that Wikipedia’s fairly short encyclopedic entries provide them with a quick “overview” of a topic from which to orient their research process, and some teachers agreed. Thus, rather than attempt to control which websites students utilize in completing school assignments, or even their very use of online resources, the underlying philosophy for many is teaching their students to be better information consumers in the digital arena. In general, the AP and NWP teachers in the study feel their students are very receptive to learning effective research skills, but point out that teaching these skills is not without challenges. By far, the most commonly cited challenge is simply a lack of time to devote to developing effective lessons and teaching skills in class. Teachers repeatedly noted the difficulty in covering these skills in addition to the other content they are required to cover. They also note that they themselves must become savvy information consumers before they can impart these skills to their students. Among other challenges teachers report facing are pay walls separating them and their students from the best information online and digital access issues among their students. Teachers stressed that the best, most credible resources on the internet are often available only by subscription, thus many schools and students do not have access to what is truly the highest quality information in a particular field. In addition, they point out that for many of their students, research time is restricted by a lack of internet access at home and/or limited library hours. The survey also indicates that these teachers face a variety of challenges in effectively incorporating online content and digital tools into their classrooms, some of which may hinder their ability to teach students how best to conduct research online. Virtually all teachers surveyed report working in a school that employs internet filters (97%), formal policies about cell phone use (97%), and acceptable use policies or AUPs (97%). 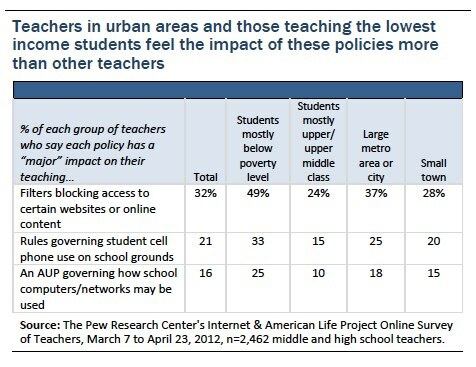 The degree to which teachers feel these different policies impact their teaching varies, with internet filters cited most often as having a “major impact” on survey participants’ teaching (32%). One in five teachers (21%) say cell phone policies have a “major” impact on their teaching, and 16% say the same about their school’s AUP. Looking more closely at subgroups of the teachers surveyed, it becomes clear that those teaching in urban areas and those teaching the lowest income students are feeling the impact of these types of restrictions more so than those living in other community types and those teaching students from mainly upper and upper middle income households. In particular, teachers of students living in poverty are at least twice as likely as those teaching the most affluent students to report these policies having a “major” impact on their teaching.